ESL Power Systems, based in Corona, CA specializes in engineered power distribution solutions that are safe to use and easy to operate. ESL manufactures a line of emergency power connection equipment for commercial and industrial applications like gas stations/convenience stores, grocery stores, cold storage facilities, distribution centers, healthcare facilities, data centers, manufacturing plants and much more! ESL products like the StormSwitch™ (Manual Transfer Switch up to 3000A), TripleSwitch™ (3-Way Manual Transfer Switches up to 3000A) and TempTap™ (Generator Docking Stations up to 3200A) lead the industry with their UL/cUL 1008 listing. The Arthur N. Ulrich Company is proud to be the manufacturer's representative for ESL Power Systems in Ohio, Kentucky, Indiana, West Virginia, Michigan (lower peninsula) and Western Pennsylvania. Contact us today to get started on your emergency power next project! 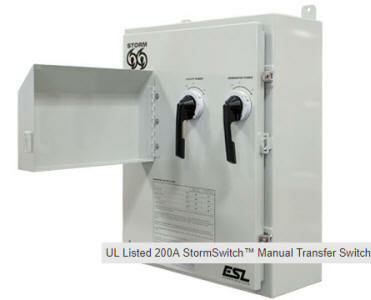 StormSwitch™ is a manual transfer switch that is UL/cUL 1008 Listed to 3000A and provides an economical commercial solution for businesses that want to be prepared for emergency power loss. Equipped with safety-interlocks and color-coded cam-style receptacles, ESL’s patented StormSwitch™ ensures a safe and simple hook-up to a portable power generator during a power outage. ESL’s UL/cUL 1008 Listed TripleSwitch™ is a dual purpose solution to service those facilities that utilize an automatic transfer switch and a permanent generator. 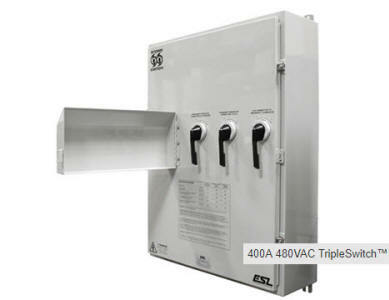 The TripleSwitch™ provides three interlocked breakers to isolate the permanent standby generator circuit from the ATS during load bank testing. The TripleSwitch™ also provides a means to quickly connect a portable backup generator to the ATS while the permanent generator is offline. ESL’s TripleSwitch™ combines female quick connect cams for the load bank, and male quick connect cams for a portable backup generator. Connections are simple and quick, reducing set-up times and wiring mistakes. ESL’s UL/cUL 1008 Listed TempTap™ generator docking stations are designed to provide end users with a safe and simple solution to connect a portable generator to a grid-tied facility. TempTap™ is a pass-through junction box that can be mounted to a building and is typically hard-wired to an upstream circuit breaker enclosure or system, such as a transfer switch or utility disconnect. Similar to ESL’s StormSwitch™, TempTap™ provides operators with color-coded cam-style receptacles to ensure a quick, safe connection to a portable generator. 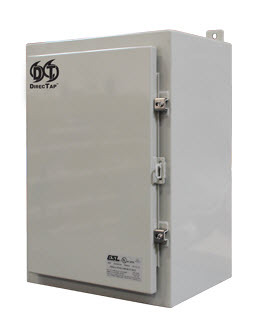 ESL’s OutTap™ Outlet Boxes are UL/cUL 891 Listed and designed to provide end users a safe and simple method of taking power from a facility’s power source and distributing it to exterior electrical equipment via 400A cam-lock cables in lieu of utilizing a portable generator. Outlet boxes are simple pass-through boxes that are mounted to the exterior of a building and wired to an existing power source. These boxes can be designed with or without a breaker based on your facility needs, and provide operators with color-coded female cam-style receptacles to ensure a quick and safe connection. In addition, if your facility has an available breaker up stream, outlet boxes can be designed to include a dead switch to the main utility breaker on the door for added safety. Utility breaker would be manually reset after device connection. 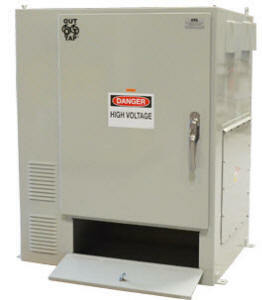 ESL’s industrial grade DirecTap™ is a UL1773 Listed termination box. Equipped with power distribution blocks, these direct wire tap boxes are designed to make lug connections to permanently installed equipment such as an ATS, UPS, or supporting switchgear. DirecTap™ enclosures are available in a variety of types ranging from Type 1-4X. 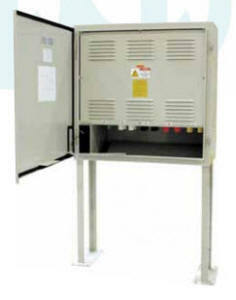 ESL’s termination boxes provide a permanent connection to emergency power systems for a variety of facilities, including refineries, pharmaceutical, food processing and manufacturing.